ZWR enthusiast Gabi is avante-garde. As his Twitter profile details, the G-Man enjoys thinking, designing, developing, and creating. 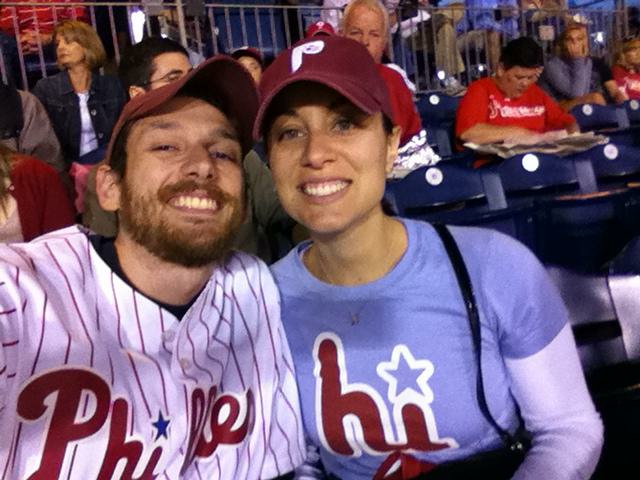 But yeah more importantly this donkey was at last night's Phillies victory with the coolest person* in the ballpark! Yup, that's Mrs. Gabi's wife (whose name he thinkingly creatively didn't tell me (smdh)) in the ever-adorable "Hi" tee. Wow, that layers perfectly and even goes with retro caps. What a great shirt, ZWR!